This healthy and vibrantly vegan noodle bowl is packed with seasonal spring-time produce that’s high in fiber and nutritional quality while light in saturated fat and cholesterol. Colorful and flavorful, this dish sure does make a crowd feel good (or halve the recipe if it will be making lunch or dinner for just one happy camper), and is a great way to herald in the brighter days of spring. In a small bowl, whisk together all of the ginger-sesame dressing ingredients and then allow to rest and infuse on the counter while preparing the rest of the dish. Bring two big pots of water to a boil. In the first boiling pot, add in the soba noodles and cook until al dente, according to package directions (probably about 5 minutes). Then drain and briefly rinse under cool water. 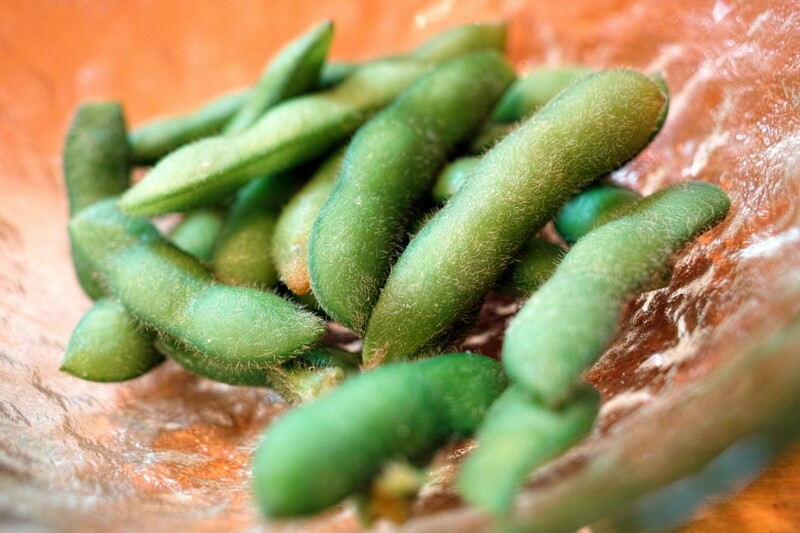 Place the frozen edamame into a steamer basket and place it over the second boiling pot of water, until the beans are warmed through (about 4 to 6 minutes). In the last minute of steaming, add the halved snap pea pods into the steamer basket. Then remove the steamer basket from the pot. Combine the soba noodles, edamame, snap peas and carrots in a large serving bowl. Pour in the dressing and toss carefully with tongs. Toss in the spring onions and chopped cilantro and sesame seeds. Serve.